A technician uses a PDA to scan equipment and collect data. Although pests have fallen within this definition of adulterants since then, it is only with the passage of the Food Safety Modernization Act (FSMA) that GMPs — including those for pest control — transitioned from guidance to regulation, and that pests were specifically named as one of the hazards requiring preventive controls and inclusion in a written Food Safety Plan. That conversion to law has brought with it an even greater focus on pest management standards and innovative technologies for food facilities. INTEGRATING TECHNOLOGY. To meet, or exceed, today’s requirements and standards, food facilities need to ensure that the pest management service provider they select is truly capable of solving any common pest problem that poses a threat to its brand, said Chris McCloud, McCloud Services president and CEO and author of the white paper What You Should Expect from Your Pest Management Professional…What They Should Expect from You. Thus, in addition to controlling pests, pest management professionals (PMPs) should have the technologies that enable them to analyze and interpret quantitative and qualitative data. Technology can enable you to capture information and access it whenever needed. Consistency and Accuracy of Information. Especially for those who operate multiple locations, technology can enable you to have site information delivered consistently, accurately, and in a timely manner — for all sites. Time Savings. Technology can improve your audit preparation by enabling you to capture information and access it whenever you need it. Because you have access to the information at a key stroke, the time required to prepare is significantly reduced. Increased Success of the Pest Management Program. Site data can be used for trending of pest pressures and developing practical threshold action plans. Threshold action plans support a solution-oriented integrated pest management program, McCloud said, and trending supports strategic placement of equipment and use of pesticides and provides a more efficient program. ELECTRIC MONITORING. One of the newest technologies that aids in FSMA compliance and provides many of the benefits are 24/7 remote electronic monitoring systems for rodent control stations. “The box is doing a job for you all the time, so it needs to have more than an alert,” said VM Products President Ethan Vickery. As such, electronic monitoring which includes a software program integrated with a sensor, provides value in its active, real-time data collection. 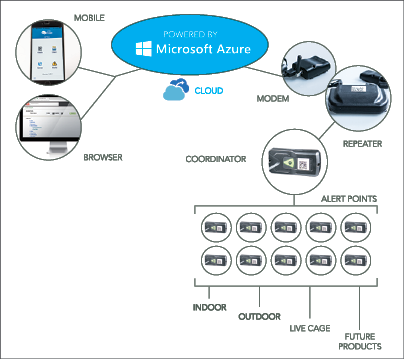 “The hardware gives the alert, the software gives the data; and it’s important that the elements talk to each other,” said IoT Box Systems Vice President of Business Development Ronen Amichai, with whom VM Products developed its electronic rodent monitoring bait stations. That is, the delivery of real-time data of rodent entry into a station enables you to track and trend each unit and use this information in ways that were not previously possible, Vickery said. For example, you may see that a station just inside the dock door is capturing rodents every Monday afternoon … the same day and time as your regular deliveries from XYZ supplier. This gives you a strong indication that the rodents are coming in with the delivery, the doors are being left open at this time, etc. It provides a starting point for further inspection. The delivery of real-time data of rodent entry into a station enables you to track and trend each unit and use the data in new ways. Because the system is active, not passive, “you get dynamic information, so you can make dynamic decisions,” Vickery added. This means, however, that a person must be responsible for paying attention to it, then be ready to act to inspect for root cause and take corrective action, whether that is performing exclusion work or simply reminding employees to not prop open doors. “The longer the system is in place, the more meaningful the data becomes,” Amichai added. In addition to measuring trends, “you can understand why things happen, because it is also gathering data from the human side — the pest management professional’s reports.” Then, from this, they can redirect their time to the hot spots. A NEW STANDARD. Electronic monitoring has, in fact, become important enough in the food industry that the National Pest Management Association (NPMA) added a section on the topic to its recently revised 2016 Pest Management Standards for Food Processing & Handling Facilities (previously titled Pest Management Standards for Food Plants, last revised in 2013). As the Standards state, “Remote electronic monitoring technology for pest management devices provide an opportunity to use advancements in technology to improve the overall efficiency and effectiveness of pest management activities.” NPMA, it adds, “views this technology as a viable addition to a sound science-based IPM strategy.” But, said NPMA Director of Public Policy Andrew Bray, you also need to have data that backs up the fact that the technology is working. Another important section added to the 2016 Standards is a sample risk assessment, Bray said. Including a scoring key, it fulfills the FSMA requirement for risk assessment of pests. In fact, a primary purpose of the issuance of new Standards was to provide updates and improvements to better address changing regulatory requirements, new technologies, and better IPM practices.